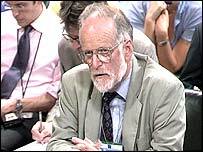 David Kelly ended his life feeling betrayed and belittled by his political masters. In the poignant words of his widow, Janice, he was broken hearted and dismayed at the way he was being treated. The man who had "worked his socks off" for his country, was being dismissed as a junior official who was being publicly reprimanded by his MoD bosses for giving a secret briefing to the BBC's Andrew Gilligan. But, in quiet, measured tones, Mrs Kelly painted a strikingly different picture from the one so far offered to the inquiry. It was the picture of a man at the top of his profession, central to the weapons inspection programme and who was deeply committed to his job. The storm which engulfed him after he was named as the suspected source of Mr Gilligan's report left him distraught, angry, worried about his future and, ultimately, broken by it all. Mrs Kelly did not point the finger of blame. Instead she let her simple, unemotive testimony speak for itself. The result was, none the less, devastating. It dramatically sharpened the criticism already being levelled at Defence Secretary Geoff Hoon and Downing Street officials for their part in his naming and their descriptions of him. Notably the prime minister's spokesman Tom Kelly faced stinging criticism for describing Dr Kelly after his death as a "Walter Mitty" character. The BBC did not emerge unscathed - Mr Gilligan's report was questioned by Dr Kelly's daughter, Rachel, who claimed her father could not believe the journalist could have based it solely on things he had told him. He did not recognise many of the comments he was suppposed to have made, she told the inquiry. Other criticism of the media centred on a Sunday Times journalist who arrived at their home uninvited and spoke to Dr Kelly about an alleged offer from Rupert Murdoch to put him up in a hotel before the press pack descended on him after his name had been made public. Dr Kelly: Thrown to the wolves? Mrs Kelly's testimony, along with that of Dr Kelly's sister Sarah Pape and daughter Rachel, detailed how Dr Kelly had been passionate, if secretive, about his work and committed to doing his small part to rid the world of weapons of mass destruction. Far from the impression originally given by the MoD and Downing Street, he was an extremely senior official whose job description included briefing the press, both officially and unofficially. Initially, after he volunteered himself as the possible source, he said his MoD bosses had been "not unsupportive". By the end of the "nightmare", he was less certain of the support from his bosses. He was dismayed that, despite assurances, his name had been made public. He became withdrawn, retreated into a world of his own and, on the day he apparently committed suicide, he could not put two sentences together. Mrs Kelly's testimony was always going to be a turning point in this inquiry and Mr Hoon, the Ministry of Defence and Downing Street all had reason to fear what the distraught widow might say. 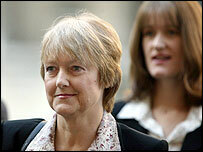 She chose not to appear in open court, as did her daughter Rachel, but she remained calm and measured throughout. And her evidence was probably the more damaging to the government for that. It amounted to a detailed account of how her husband believed he had been betrayed by his bosses who then went on to try and play down his status and responsibilities. It was hard not to draw the conclusion that this was a man who believed he had been thrown to the wolves. It was equally hard not to draw conclusions about who Mrs Kelly believed bore the major responsibility for that impression.